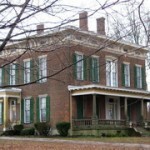 The 1858 Hannah House, built by Alexander Hannah, was part of the Underground Railroad. Sadly, one night as a group of traveling slaves was sleeping, an oil lamp overturned and ignited the straw nearby, killing them all. Hannah buried their bodies in the cellar in an attempt to keep his assistance a secret. The slaves’ ghosts are believed to remain in the cellar. Witnesses have seen apparitions, heard moans and voices and felt cold spots. Saw a ghost in the basement on a tour a couple years back. Now they don’t take you into the basement. My sister rents out the servants quarters of this house and i have stayed with her and i have also toured the main house. Its a beautiful house. I was only there with her for a weekend but i experienced strange things while there and her and her husband continue to experience things often. My mom worked with the Guy at quickpak, who took care of the grounds. My mom and dad did karaoke on the side. Well he ended up hiring my parents to do a party there, that is one beautiful house but my hairs stood up a few times..